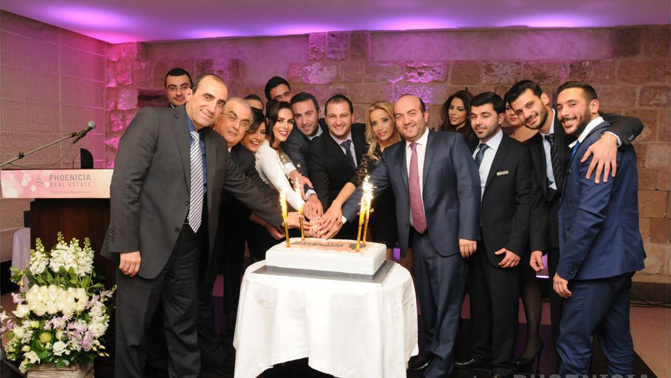 For the second year, Phoenicia Real Estate held its annual awards celebration dinner at Byblos Sur Mer. The event was celebrated in the presence of the representative of Jbeil's Mayor, Mr. Khaled Al Lakkis ,members of the Syndicate of Real Estate Brokers in Lebanon which were lead by Captain Massaad Fares and members Mr. Ahmad Al Khatib and Mr. Walid Moussa. The event also was attended by several entrepreneurs from the real estate industry as well as many business men. In recognition of it's employees', agents' and managers' hard work and efforts during 2014, several awards were distributed during the celebration.